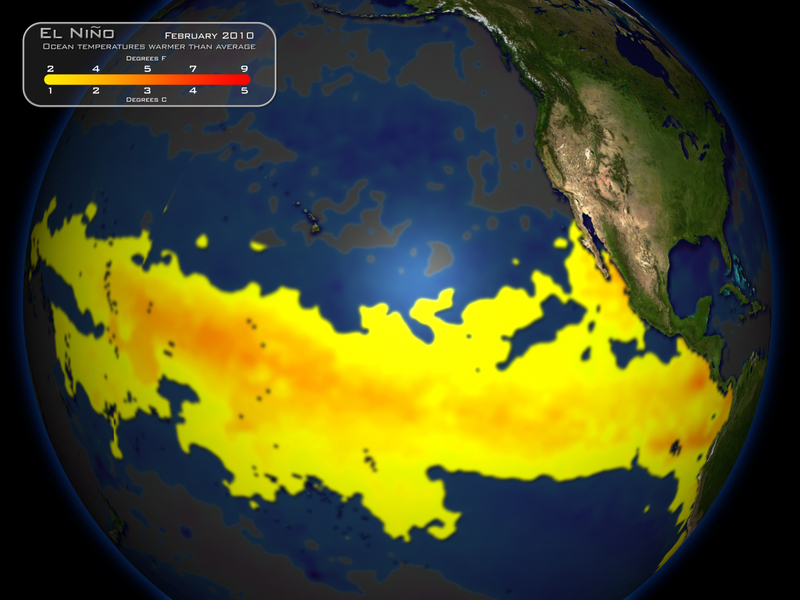 ENSO color tricks from NOAA's Environmental Visualization Lab | Watts Up With That? Or, “how to hide the decline with color”. Here’s the image and press release from NOAA NNVL this week to push their hurricane season announcement. Notice anything odd? [Thursday] NOAA issued the 2011 Atlantic Hurricane Season Outlook, which predicts an above-normal year for activity. Though the La Niña continues to weaken in the Pacific, it will continue to effect weather patterns and influence the number of storms that are predicted. During La Niña years, wind shear is reduced in the Tropical Atlantic, creating conditions that are ideal for tropical cyclone formation. This image shows how the sea surface temperatures have changed, on average, from mid-April to mid-May. A warming signature is clearly visible as indicated by the red areas in the Eastern Equatorial Pacific region, an indication of La Niña’s waning strength. Also related to the Atlantic Hurricane Season, warming trends are visible in the Caribbean and Eastern Gulf of Mexico. To be fair, the top image this week from NNVL is about the change in SST, while the two examples above are the current SST. The point I’m trying to illustrate is not about the data, but about the choice of color used to visualize the data. I wonder what the scale might look like when we have a strong El Niño heating up the planet? Gosh, El Niño looks angry and threatening doesn’t it? All those fiery reds, yellows and oranges. Notice how the red/blue color scale is inverted expanded, compared to the one they used this week, with the neutral white being just a notch on the scale. And for some bizarre reason, they decided to include land temperatures with SST…which they didn’t do in the other images above. The result is the planet still is filled with raging red when trying to communicate a cool SST event. What we have here, is failure to communicate a concept consistently with color. Imagine the confusion if Unisys or other SST product imagers changed their colors with each image release? So far, NOAA NNVL has not been able to present a consistent color scheme for images that will be mass distributed to the public and press. Each visualization has a different color key. I think NOAA NNVL should standardize on a SST color palette scheme no matter what the ocean conditions are. Next time we have an El Niño event, and these guys image it, let’s make sure we remind them that they need to be consistent. Next time they image ENSO in color, let’s “help them get their mind right”. Cool, cool hand NOAA. Well, those hurricanes better hurry! How much time do we have left, a few hours? Isn’t every year an above normal hurricane season? Climate change affects the color spectrum! It’s worse than we thought! Pint should be Point. No need to publish, latitude found it first anyway. Data visualization is a science. Those that produce these graphics are professionals who use that science. Every aspect is engineered to produce just the right message. If the presentation seems to “color” the impression of the audience, it is because that is exactly what it was intended to do. This just continues the games played by computer climate modelers when it comes to the Earth’s climate. Absolutely brilliant post Anthony. ‘Nuff said. Two pints make one cavort. But the real measurement issue is that the NOAA NNVL chart is for change in SST for a single month. All the other charts show anomaly from some decadal average. If you compare the red-orange areas west of South America in the second chart to the red areas in the NOAA NNVL chart, you’ll see that La Nina conditions are, indeed, weakening. I doubt if the chart was intended to make any conclusion other than that. Don’t need no stinkin color to tell me to put another log on the fire. All the red is 5C change in one month? Holy crap!!!! It seems you are trying to compare apples and oranges here. SST images with SST change over a period. The NNVL image is showing the CHANGE in SST’s over the period of mid-April to mid-May. White is shown as no change, so you’d expect there to be lots of white on the image (or washed out). I do agree though that images are manipulated by both sides of the AGW issue to try and make their point stronger, but I don’t think this particular image has anything to do with that, and I find it quite useful to as a quick summary of SST CHANGE. Anyone remember that a state that went Republican in a presidential election were blue and Dem states were red? Then one year about a decade ago, all the media seemed to swap their colors. Huh? I’m not seeing it, inverted how? Paint job. You can bring on an Ice Age or set the Tropical Pacific on fire with a few clicks of the mouse. I guess if “waning La Nina” means transitioning from the 2nd strongest La Nina MEI index during the past 60-years in the month of January to the 4th strongest La Nina MEI index in April, then their visualization is quite informative. This visualization is a stupid piece of science — the relative change of SST from April to May means very little when examining snapshots like this. Bruce says: “All the red is 5C change in one month? Holy crap!!!! Seems like a lot, doesn’t it? That particular area, a bit west of the bulge in South America, is a crucial one for ENSO. It’s where cool upwelling for La Niña occurs. See the last chart, showing a “cool” La Niña in Sept 2010. Notice the depth of blue in the critical area at that time. Remember, the first chart is differential, not absolute. That rising water may still be cool, just not as cool as a month or two ago. Cooling in that area raises atmospheric and oceanic densities and (particularly) viscosities, eventually presenting an obstacle possibly stiff enough to divert the tradewinds, triggering El Niño. Although the depth and extent of color, red:blue, in the last chart is a bit iffy, the NOAA website titled their post: “La Niña Dominates September’s Climate Patterns,” more clearly emphasizing the importance of the bluish regions. Another trick for making it seem that hurricane activity it “getting worse” is that tropical storms get names now, not just hurricanes. Even storms way out in the ocean that will never make landfall get names! So by the time you hear the weatherperson reporting on tropical storm Ursula or Xavier you might think, wow what a lot of storms! When I was a kid (long time ago) I never had a chance of having a hurricane named after me, because the criteria for earning a name was an actual hurricane expected to make landfall. Now they hand out names like candy just for effect. The last “hurricane Karen” was a tropical storm that briefly whupped up to a Category 1 somewhere off the Lesser Antilles then dissipated at sea without making landfall. I expected a bit more from my namesake. These forecasts all reflect a narrow range, with the numbers down considerably from last year – primarily due to an outlook for a much cooler Atlantic basin with SSTs about 1C cooler, which is indeed a significant loss of thermal energy. Mid-level upper air temperatures are also lower than last season – globally. In the first six years they made 5 good forecasts and one bad forecast and in the next six years they made one good forecast and 5 bad forecasts which again suggest the lack of any refinement in the development of forecast skill for this type of a forecast. Perhaps part of the problem was associated with some changes in forecast methodology in the past few years, or perhaps, more realistically, seasonal forecasts (including my own attempts based primarily on ENSO forecasts) still have a long road ahead before a better reliability is achieved. The seasonal forecasts were originally developed for ‘Insurance’ purposes – and they are probably still used by various insurance companies for planning potential claims payments. Note that the range of named storm forecasts in the 12-year period has been from 10 to 17 and the actual totals ranged from 9 to 28. Two hyperactive seasons were forecasted but did not verify (2006 & 2007) but one did come close (2007). On the other side of the coin, four hyperactive seasons did occur that were not forecasted in April (2003, 2005, 2008 & 2010). a) uses black instead of white for neutral. b) extends navy blue through royal blue to bright blue (approaching extreme lows). c) extends red through orange to bright yellow (approaching extreme highs). What we have here is not a failure to communicate. What we have here is the result of all those “Communication of Global Warming Climate Change To The Public” conferences of the past year. Aahhh. So you agree the map is totally misleading. Thanks. We need a name for this phenomenon. “Storm Creep” comes to mind but I am sure that WUWT commenters can do better. The US taxpayers are footing the bill for this blatant fraud to hide any weather pattern that does not fit the global warming agenda. In Canada, the Prime Minister with a minority government defeated the opposition sponsored cap and trade and has been rewarded with a majority government. In contrast, the US President with a majority government has been pushing cap and trade and was handed a “shelacking” in the last election. The Canadian economy came through the recent financial crisis reasonably well. In contrast the US is still in serious financial trouble. Coincidence? Hardly. The US dominated the world economy through energy production. When you have the low cost energy, companies move to your country. Jobs and prosperity result. Tax revenues increase and deficits decrease. When you increase the cost of energy, companies leave and take the jobs and prosperity with them. Tax revenues decrease and deficits increase. This isn’t rocket science. It is happening consistently everywhere you look in the world. Email, write, phone your elected representatives and let them know where you stand. Let them know that their prosperity depends on your prosperity. Their jobs depend on your jobs. All it takes for evil to prevail is for good men to do nothing. Eruption in Vatnajökull / Grímsvötn glacier started tonight. Woe to those, that underestimate the masses. … actually cooled off instead. Open in new tab and click back and forth. April 15th SST Anomaly. More info about the eruption in Vatnajökull. Eruption has started in GrímsvötnAn eruption began at Grímsvötn volcano at approximately 17:30 UTC, May 21st 2011. Eruptions in Grímsvötn start as subglacial eruptions, which quickly break the ice cover. At 21:00 UTC, the eruption plume had risen to an altitude of over 65,000 ft (~20 km). Initially, the plume is expected to drift to the east and subsequently to the north. Thus, the ash is not expected to impact aviation in Europe, at least not during the first 24 hours. The figure on the right (above) shows an image of the eruption cloud at 22:00 UTC. The image is from the Icelandic Met Office weather radar located at Keflavik International Airport, at 220 km distance from the volcano. The cloud extends above a large part of Vatnajökull ice cap. The line marks the approximate location of Grímsvötn volcano. The last eruption in Grímsvötn occurred in November 2004. Grímsvötn is Iceland’s most frequently erupting volcano. The figure below shows tremor activity in Grímsvötn associated with the eruption. Note that seismic activity increases after 17:30 UTC. Yep, they even use it on the 5th graders. Instead of teaching history, logic and arithmetic. To have a strong hurricane season I thought it mandatory to have an active La Nina and not neutral conditions as now. Thanks for the laugher Joshua! What NOAA did was a common statistical trick. They used a different, but valid, measurement in an attempt to fool people. Here is an example of a statistical trick: Suppose Town A had a population increase of 100% and Town B had a population increase of 10%. Which sounds like it is growing faster? Town A of course. However, what if I told you Town A had a population of 10 and it gained 10 people but Town B had a population of 5000 but gained 500 people during the measurement time. Now which do you think is growing faster? In college I was required to take a statistics class. One of the lessons was how to make statistics tell the message you want while still being truthful. There are many ways to distort the ideas with stats like this. What NOAA did was, not tell you the temperature, but tell you the temperature change. They knew that showing the temperature would convey the wrong message. So, they used a different measurement to tell the message they wanted. These are things that every math student should know how to do. Jessie, you get to pick the colors. Try changing them to your preference. By the way, very COOL graph page. If you let the data speak before you start your statistical analysis, you often get a more accurate reflection. I like to do raw data scatter plots first. From there, I choose an analysis that would describe, in statistical terms, what I am seeing in the raw data. If presenting to a group of people, I always start with the raw data scatter plot and ask the audience what they see. Data speaks. And the conversation will often lead to a suggestion by the audience as to what statistical analysis would be a proper fit. The only drawback to this, is that belief trumps data. Nearly always. However, by letting the scatter plot speak first, belief can be cajoled into sitting down while the raw data is allowed to have a conversation with the audience. Yes, but more than a decade ago. Probably Clinton’s 1992 election, or possibly the 1996 election. I remember thinking how ironic it was that the media portrayed the leftist Dems as “Reds” every election, but then suddenly they were the “Blue” states. Furthermore, all the networks switched the same year, as I recall, which makes me think it was 1992, before Fox News really got rolling since they would have resisted the change, I suspect. It was a coordinated effort by leftist news organizations to remove what was becoming an embarrassing association. 1) Remember the jiggering of data to get rid of the MWP and the LIA to usher in the hockey stick? The trouble with this is eventially you are forced to jigger them back again so that the cooling period coming doesn’t look like the coldest in a thousand years. 2)They had to jigger the 30s temps down to make the 1990s temps hotter when they could see that 1998 was the last gasp of the recent warming period. 3) They had to stop reporting on sealevel rise for 8 months while they figured out how to jigger it to stop it from going down. They wound up adding on an annual factor to sealevel data to account for sealevel drop due to glacial isostatic rebound. This gave a sealevel rise that was otherwise a sealevel drop – they were prepared to destroy an actual metric of use to coastal/harbour engineers and navigators to stop the decline. Now in 30-50 years, the sealevel will indicate that the Maldives and river delta states are under a foot of water when they are actually high and dry. 3) Hansen, under the growing tension (it must be terrible for about a dozen of the most zealous CAGW folk) is now easing in the idea that the world will cool but he can’t let go of the human fault dimension after making such a hue and cry in Congress, protests at coal mines in Virginia and plants in UK and the score of asinine projections that are now proving grossly wrong. He is blaming aerosols – not a la Svensmark – but those manmade ones that originate from the “death train” coal burning. Please keep a good record of these egregious “adjustments” – they’ve gone from moving the goal posts to changing the game entirely. And R. Gates: you had better move to 50% warmist from 75% (don’t be defending notions that Hansen et al have been abandoning. I see you defending having a temperature scale that is nearly all white except for the red and blue tips of this post to erase the remains of la Nina. Its okay for you to agree that they are not right all the time. I’m confused about one thing (at least). The article says, “the top image … is about the change in SST, while the two examples above are the current SST”. But both of the latter images carry labels with the term “anomaly”. To me it looks like the difference is between two kinds of change: one between April and May temperatures, the other with respect to some standard baseline temperature. Yea, I think they changed about 1984-88? The Democrats were tired of being occularly associated with the Communists. If you notice, all the MSM stations use light blue backgrounds and blue-ish gray for undecided states in their election night maps in order to convey a more “Democratic” nation. It’s very easy and effective to “Lie With Maps” (a very good book by Mark Mortimer I think) as people really tend to take maps at face value. Now that powerful desktop mappers are available any hack can pretty easily create a nice map, but without the training in the “art and science” of cartography that is so important. In the first image the red-white-blue isn’t a horrible choice, but blue certainly doens’t pop out like red. The third image is definately the best constructed of the three IMO, as far as color and projection. Exactly, and this is something a real cartographer would have accounted for, unless of course they were subverted by the Climate Ninnies as well. I guess “movie night” at the NNVL last week was Schindler’s List? Maybe they’ve hit a bit of a funding crunch, and can’t afford replacing the color toner cartridges until next month? My college required a statistics class, as well. I went into the semester convinced I was going to be bored, but it wound up being a fascinating class, as my eyes were opened to just how careful one needs to be when developing visualizations of data to keep everything neutral. I don’t recall any assignments where we were specifically instructed to distort. This professor was all about absolute, unwavering integrity; show the data simply, in a straighforward and easy to understand manner, and let it speak for itself. The very notion that a scientific organization would be publishing a map that shows changes in temperature change (temperature delta delta, can I helpya helpya?) would’ve irked the man on a fundamental level. Something like that requires a level of mental “digestion” that most people won’t bother to conduct, and will simply glance at the picture, and take in the initial “taste” of, as Anthony put it, weak soup. I don’t know if it has been mentioned yet, but not tooooo long ago only hurricanes were named . . . and now we have “named storms”! (giving the illusion of more storms if, you are my age)!